From day-to-night dresses to sophisticated co-ordinates, step into spring with a fresh new wardrobe. Our key tip is to invest in versatile transitional pieces that you can wear whatever the weather and style your own way. Embrace this season’s trends and find your new looks from feminine florals to romantic classic lace. Hit refresh on your wardrobe with our favourite sale picks from Hobbs and save less! No spring wardrobe is complete without a new dress or two for those events in your calendar, and these dresses are just perfect for a wedding. Invest in modern prints and silhouettes to style all year through. Find your perfect outfit in the amazing sale at Hobbs. We’ve chosen our top new season sale styles, but you need to be quick! This incredible up to 50% off sale ends soon on the 25/03/2019. 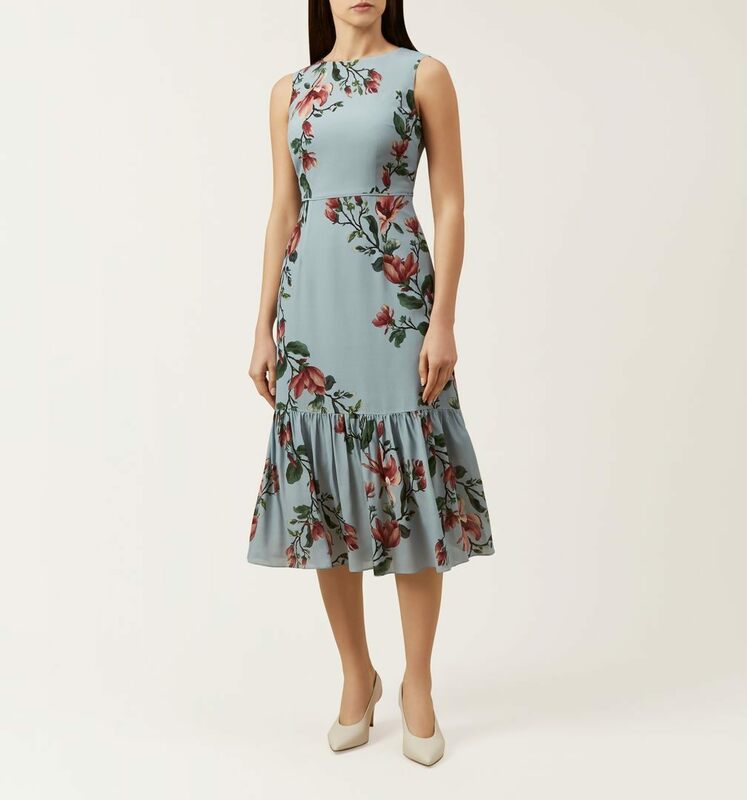 The effortlessly ladylike Hallie dress is patterned with signature pretty florals, this midi dress is made from lightweight material and has a floaty frill hem, perfect to dance the night away in. Perfect for a modern mother of the bride or groom, the Gillian dress is a contemporary piece which offers style and ease by equal measures. It comes in a relaxed flattering silhouette with seam detailing to the sides and is crafted from a premium cotton-rich yarn in a compact Milano stitch for a super flattering look. Transition effortlessly from day to evening – this dress is perfect for a spring wedding or event. If you’re really looking for something special to turn heads, the Arabella co-ord is the perfect choice. The contrasting print and monochrome tone combine for a truly stunning look. Crafter to flatter, the matching coat takes the ease out of shopping for a wedding outfit and has you covered from day to night in style. If you want arm coverage yet don’t want to invest in a matching coat, a brilliant option is choosing a jacket in the same colour. We adore the bridgette dress and Seraphina jacket combo. Pure elegance, the stripes look simply stunning paired with the A-line silhouette and cinched waist. The jacket is a key piece which can easily be used for future events when block colouring with sleek separates and classic shifts. From weddings to al fresco evenings, opt for the Sara dress for all your spring/summer diary dates. Its flattering wrap design flatters, whilst the ruffle hem adds a little formality. Crafted from lightweight jacquard fabric that skims your figure, it features balloon sleeves and a high-low midi skirt for an effortless style. Dress up or down with sandals and metallic jewellery this season. 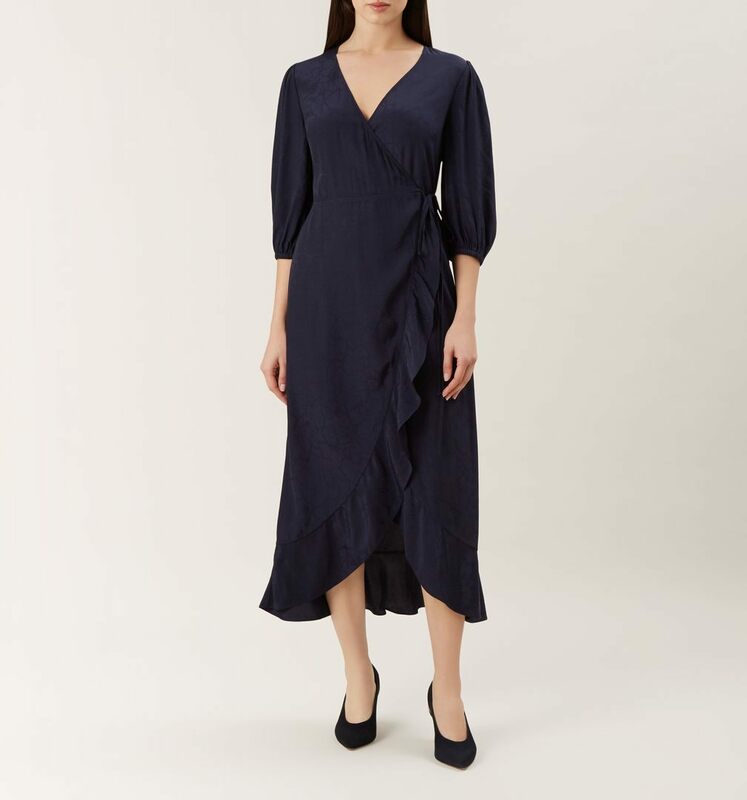 Filled with delicate inspired details and cut from soft stretchy cotton to hug the body, the Penny dress has a round neckline and contrasting panels that accentuate it’s figure-skimming shape. It’s a gorgeous shift sure to stand out at weddings and parties this season. The Aurelie dress oozes an English garden feel and would be perfect for an outdoor wedding setting. Made from delicate georgette, it’s printed with pretty florals and finished with semi sheer sleeves for glamorous coverage and a nipped in waist to define your smallest part. An all round winner, style yours with a pair of strappy sandals and slim clutch. You can always rely on a black jumpsuit for parties, weddings and evening events. This version has a keyhole contrasting neckline and is detailed with a flattering cinched in waist. Highlight the wide length with your most eye-catching sandals. You’ve seen our favourites, what are yours? Head to Hobbs now to discover their amazing up to 50% sale and new arrivals to turn heads! PreviousPrevious post:Just Landed! Discover Bridesmaid Dresses From HobbsNextNext post:Newness You’ll Love From Hobbs | Ready For Wedding Season?